I am truly excited to be sharing with you the industry insider knowledge and insights that I have personally learnt on the amazing topic of Video Marketing. Hello, my name is Marcus Seeger and I am the founder and Managing Director of Australian Production Company, Video Experts and online training resource, Video Profit Formula. In other words, just over half of all marketers surveyed believe that for every dollar spent on video, the returns outweigh all other forms of marketing. ROI on video is out performing other forms of marketing such as print advertising, public speaking, photography, printed books and e-books. There is no doubt that video is effective. Video is also rapidly growing in popularity as we see more opportunities develop with social media almost every month. It appears to me that video marketing is coming of age. Video Marketing is The New Black. “There is video and then there’s VIDEO. Marcus did a great job in showing how video marketing really fits in with the bigger marketing strategy and how just churning out videos is not good enough anymore” Mihir Thaker, Executive Coach. Check the Amazon reviews for more comments. Why read this book? Without doubt, online video is the fastest growing marketing tool on the planet. It is creating a dynamic element to business marketing strategies. By harnessing the power of video you too can achieve accelerated business growth. I draw upon my real world experience to bring you the very latest video strategies. You will learn 14 highly effective video strategies for small to medium business owners. Strategies include attracting and converting profitable leads, leveraging video with social media and becoming an authority in your field plus so much more. Deliver Knockout Presentations to Camera like a Pro! And there is more! I have included Bonus Video Training as part of the book as well! A little about me: I first discovered the power of video in 2003 when I was studying multimedia design at Swinburne University in Melbourne, Australia. I have now been in the video industry for over a decade and have been behind the camera for 1000’s of hours. I have personally seen what works and what does not work when it comes to clearly communicating in front of the camera. I’m absolutely passionate about leveraging video so business’ can clearly connect with their audiences, both externally (customers) and internally (staff) and increase profits. This is a must read for all entrepreneurs who are committed to rapidly growing their business and positioning themselves in another league to their competition. 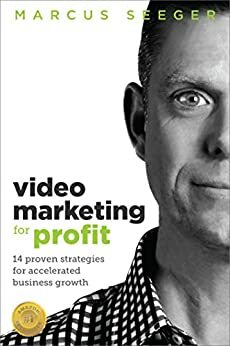 5.0 out of 5 starsA must read book on how to market your business using video. I have been telling my marketing clients for years to use video. This book finally makes the understanding the whole process simple to understand and action. I really loved the section on scripts as knowing what to say and how to say it can be really hard and stop people getting started. If you want to maintain the edge over your competition then you need to read and action the advice Marcus gives in this practical and fun book. I have found this book very informative. I am a business owner & have started using social media for marketing which has been somewhat successful. The tips & strategies in this book will enable me to take this marketing platform to another level. From my research into what Marcus provides is that he is not only an expert behind the camera but he also is an expert in front of the camera as well. This makes him a very capable resource in any marketing campaign. We'll done Marcus & I am already putting your tips into practice. 5.0 out of 5 starsExcellent resource for entrepreneurs wanting to maximise profits. The author has clearly and succinctly outlined the key areas involved in planning, producing and distributing video for marketing purposes. The references and examples are up to date, and paint a very logical and straight forward picture for both small and larger organisations. I highly endorse this simple but very targeted resource for both the seasoned and novice entrepreneur. I will be implementing all the strategies from this book for my own business as soon as possible. Lots of practical suggestions and ideas how to incorporate video into my business. Some is common sense but we all need someone to pull it all together and give us a course of action which is what Marcus does. I like the summary at the end of each chapter and there are some great links to illustrate what he is saying. Now I need to implement his ideas. Coming from a video production background, I found this book vital to growing my business. It's all well and good knowing how to make a beautiful video but the key to success is really implementing a powerful video marketing strategy! I now have the necessary skill set to not only offer my clients amazing videos but to help develop strategies to make their videos profitable. Packed full of useful tips and helpful advice that any business owner can apply to their own business. Great advice on how to harness the power of video for a powerful marketing tool that will boost your overall marketing strategy effectiveness. Well worth a read to understand and action your future business success with video.